Several fellow designers and I have gotten together to bring you all super fantastic Black Friday Deals! Some are just for Friday and some even go through Cyber Monday! Be sure to check out the graphics and use the appropriate code to get the deals! I have TWO great sales going on Black Friday 11/25 through Cyber Monday 11/28. Awhile ago I introduced you all to a nifty little technique that I learned on how to make your yarn fuzzy. This hat was my example that I practiced it on and I loved the end results. The fluffing of the yarn gave this little moose hat a more authentic look. As promised, I have this pattern now available to you for free. It is only newborn size as of right now, but if you are interested in larger sizes, please comment below with the sizes you are interested in so I know what all I need to figure out! I hope that you all enjoy it! Lilla Rose Flexi Clip Review and Giveaway! Make your own fuzzy yarn! 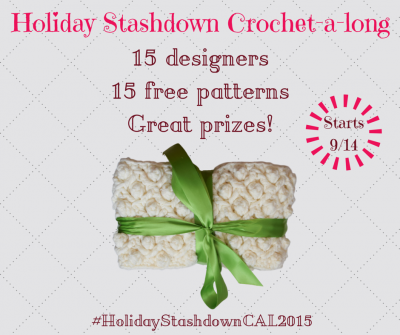 The Holiday Stashdown CAL has been started for awhile now, but if you haven’t been following it here is some information on it!